Largehearted Boy: Book Notes - Rosie Forrest "Ghost Box Evolution in Cadillac, Michigan"
Book Notes - Rosie Forrest "Ghost Box Evolution in Cadillac, Michigan"
Rosie Forrest's Ghost Box Evolution in Cadillac, Michigan won the ninth annual Rose Metal Press short short chapbook contest. This collection is as much prose poems as short stories, and is filled with haunting flash fiction built with surgically precise language. 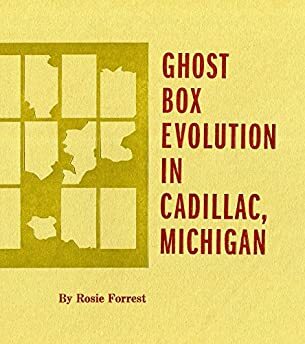 "Each flash story in Rosie Forrest's Ghost Box Evolution in Cadillac, Michigan evokes a startling, often dark, self-contained world. And each intriguing title sets a new tale into motion, unspooling with a mysterious, languid intensity." Words and music are cousins in my brain; I don't even know if they actually exist in the same hemisphere, language and melody, left brain/right brain and all that, but the song of the story is where I begin—not a specific song, but a tone or a rhythm or a chord. To make a playlist has become this intricate task because in this case, it's both exactly what I love to do (developing story from song) and the complete reverse (matching song to story). I never avoid an opportunity to work backwards. Tracking backwards can open windows and clear the brush. In all my theatre years, I learned how easily I'm sucked in by a well-crafted sound design. That's how I went at this process. Not a soundtrack, necessarily, but an answer to a question: what could take us out of each story when the lights fade? This is different—let me say—than what plays when the credits roll in the movie theatre, which is usually a song that whips you back to reality. Instead, this is what happens when standing inside the story you see a door made of glass, it's locked, but the view outside is unmistakable. So, in my mind, this playlist is what each story calls out from the last line forwards. Sometimes it's in tune with the tone or mood, and sometimes it rides the opposite wave to look down on something other. There's a hint of hope inside this ghost box, don't get me wrong, but I've learned that the dissonant chords are what interest me most. I like to hang out in the swamp and muddy my feet. Without a doubt, the lead singer's startling, childlike voice is what made my ears perk up, but it's what happens musically when she sings the word, "Still" that gives me shivers. I like to think that this is the heart of Bless This Home and its precocious narrator. A kind of hunger for stillness coasts through the story. There's a yearning for something intimate and small, and maybe that's what she finds lying in the road with the strange man, a shared quiet that shifts the universe to the left. "When colors seem to fade when I'm around," she sings, and that's okay. Preferred, even. Here's one that digs hard into opposites. I love the military rhythm that kicks the whole thing off, but what's entirely unexpected is the sing-song tune that emerges from the percussion. It even has a nursery rhyme quality. Nothing to be sung to a baby, but it runs counterpoint to the drum hits. It's the contrast of these two elements that gets at the weird meeting point of scaffolding and young skin, cavernous box stores and kid wonder. The song feels both urban and immediate, confident and naive. It's all happening at once, and though there's no real chaos, these voices and instruments threaten to let go and let the wild take over. I'd guess that Moonbone is the most optimistic piece in this chapbook. That is, despite their circumstances, the brother and sister are doing everything right to carry on. Their one moment in the woods isn't perfect but it is a way towards dawn, and this song offers up a simple appreciation for the night sky. About halfway through, the song slows to half its speed, and everything that blew right by before, now has shape. Just as the sister does in the final lines of the story, wondering whether her bother is repeating what she said, whether her brother heard her first. Regardless of who said what and when, there is the moss, the trees, the stars, the moon, and time. Where We Off To, Lulu Bee? The grit is what gets me, the behind-the-beat blue notes that sink low before they sucker punch you in the gut. This song relies on all that's not said, and isn't that the truth? On top of that, in Lulu Bee, we've got a narrator who doesn't say much at all, but years later, what if there were a moment to speak and have it cascade backwards to those early years? For Lulu Bee her moment would arrive, I think, without apology, filled with aches and dirty toenails. When Mirel Wagner sings in her weighty register, "You can't drink the dirt, even if you wanna," it's Lulu's thirst. Ok, I'll say it: I could have chosen Leonard Cohen's "Go No More A-Roving," that's for sure. It would have worked just fine, and usually Leonard Cohen wins any contest. But I wanted something to almost counter the mystery of the story. Like it's saying, "No, no. Nothing wrong over here." So the odd juxtaposition sounds like this: a seemingly buoyant melody that lifts you up, up, up as you wonder if these two girls will ever, ever be able to leave. In a playlist of mostly contemporary music, this oldie stands out as one of two or three from a different era. It's an odd turn even for Townes Van Zandt, with this choir that sounds more Lawrence Welk than Woody Guthrie, but here's the thing: this basically harmless tune turns eerie and strange when it calls out from the walls of an abandoned church, when the "velvet voices" descend and take over, lulling two girls into apathy. In the story, we don't see what they see, and we don't hear what they hear, though it might sound a little like a chorus dripping with sweetness. A soft snare drum mimics the smallest waves lapping the sand, and the time signature rocks the literal houseboat. Back and forth. Back and forth. While King struggles to make sense of his time with Uncle Bart, there's the lake, the loon, the chill in the air, and sure, it's not the ocean, but the sirens' call can come from anywhere, right? From a longing to be cared for, to be rocked to sleep by something warmer than northern lake water? She sings about "long distance," and I had to laugh because a few blocks away can feel like long distance to a new love, a whole nighttime can be a year. Her voice is playful and teenage-dreamy, although there's a touch of doubt in her lyrics when she says, "I gotta get the message to you to make you see." The whole song sounds like it's sung through a tin can, and the story, too, has that tactile feel of trying to get something right, and the editing we do before we present our most casual and unaffected selves. Ha. Yeah, that's what it's called, and boy do I love the light laugh that starts it all off. Even though the story has a morbid veil, I wanted to bring out the playful quality. It is, after all, just a game, and these teenagers are coming together to play at danger, all the while hurling fake gusto and bravado into that basement. There's no hurtful intention at first; where it goes is not where any one person takes it, and the lasting hook into Eve is no one person's fault. A classic song all dolled up in a techno costume, perfect for an off-the-wall Halloween party. Also playing dress-up is the connection between this young couple, and while I'm not sure these two would have made it for the long haul, their immersion into their pretend world is what cuts an already tenuous thread. "Don't you know no one in life can always be an angel, when everything goes wrong you see some bad," Nina says, and while Georgia would struggle to come out and say this, I can see it running through her mind as her boyfriend splits, the techno beats clouding the whole thing, distracting her from any real culpability. I'll be honest, I tried to avoid songs with "Ghost" in the title. I didn't want the connection between story and song to rely on an obvious word. This little riff gets stuck in my head like crazy. I'm drawn to the multiple voices, and how it moves forward while staying in place. That might sound loony, but give it a listen, and I think you'll agree. It captures the seesaw affect of the two families—how they travel through the same brushing past each other, touching lightly until the touch is more, and finally, too much. Another oldie, and maybe I cheated a little here. Eli sings this song throughout Taps, sings it for Josie until "I won't fail ya, I won't fail you, have no fear" becomes a promise or a bargain. A sweet tune, "Josie" is about a bigger love than the singer wants to admit. He loves her from afar even when she's in his bed. Doubtful that Eli sees that connection, but he wants to impress her, and maybe hopes that one day when two of them tromp through the winter woods instead of three, she might relent. If they ever get another chance. It's the half-sung, slightly out of tune voices on top of a lovely string melody that unsettles a person, disconnected but all dancing on the same dance floor. What I wanted to capture here was the basement staircase, the need to climb those stairs at the very end of the story, but knowing deep down that there's a certain kind of sadness up there. Younger voices singing about "no return" as if they know, but likely they don't, they can only guess at it, while the real thing is in the kitchen, a husband calling out for help as he watches his wife slip away. In an unusual twist, this was the first song I found for the playlist. Unusual because endings and final notes can consume me—can consume most writers I know—but this Heartless Bastards number rolled right into view, and there was no better place for it than the very end. "I come to you open, organs on my sleeve, won't you help me now, help me find peace," her voice comes from the gut, which I love. There's strength there but also resignation. And like the Jana Hunter song above with a boat rocking rhythm, here the rhythm walks or trudges down a long dirt road with purpose and a kind of Hades-don't-look-back sensibility, and when the strings storm the barricade, they don't ask permission. You step aside and let them run free.